Vanessa: Rockdale has recently been blessed with a new bar and dining venue that is sure to make waves. Sarita’s has opened up at the Rocksia Hotel and truly embraces convivial dining with an extensive menu designed for sharing. 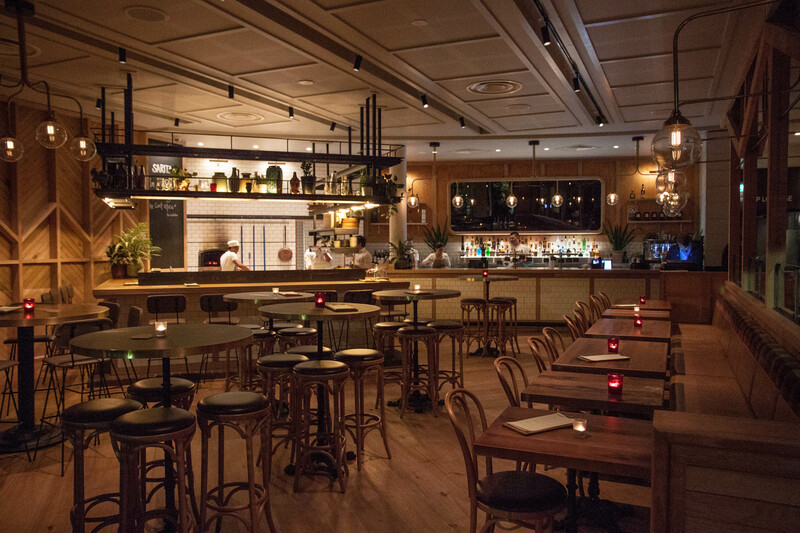 The team behind Sarita’s have thought long and hard about creating a menu and atmosphere that invites diners to relax with a beverage in hand and elegant food in tow. Sarita’s offers a very enticing drinks menu ranging from wines, beers and cocktails. 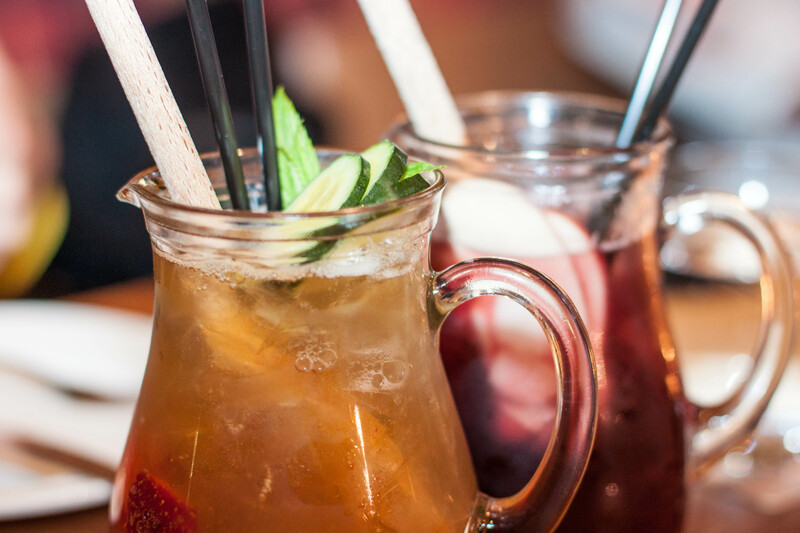 If cocktails are your thing I can vouch for the Pimms jug and sangria jug. One jug is possibly enough for two people (depending on your thirst levels) and a perfect match for grazing on the shared plates. We kicked off our evening at Sarita’s with a serve of the freshly shucked oysters ($3 each) and from the fish plates a serve of the salmon tartar with horseradish and creme fraiche ($12). A light start that eased us in to what was to come. 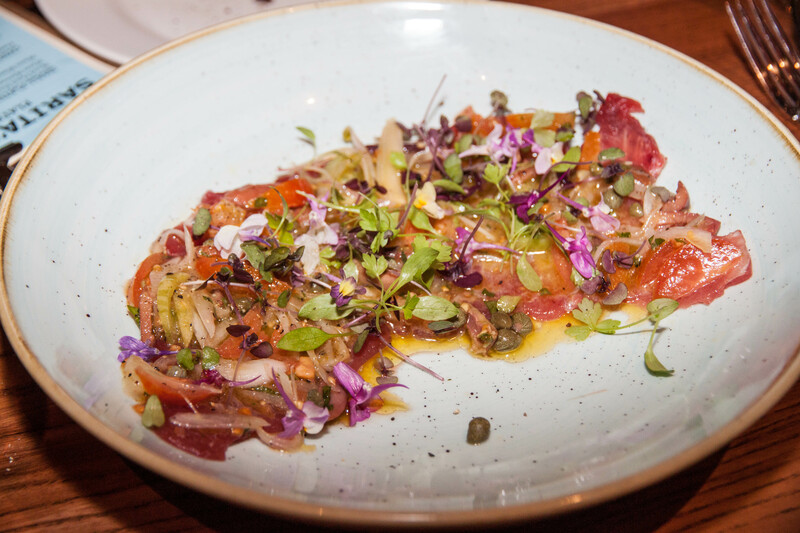 Perhaps one of the most beautifully presented dishes we tried was the yellow fin tuna carpaccio, herb salad and chilli oil ($16). This dish was delicately constructed and the beautiful aesthetics was equally paired with the lovely flavour of the dish. I believe we all smelt the next dish before it even hit the table! As the unmistakable scent of truffle oil wafted towards us, we were presented with a pizza topped with wild mushroom ragu, fontina cheese, truffle oil and Grana Padana ($17.50). Wow! The toppings worked so well together and if you are a mushroom lover then this pizza is a must try as there was a generous amount atop this pizza! The other pizza we tried was topped with spicy Italian sausage, crushed vine tomato, fontina, spinach and mozzarella ($16.50). Good coverage, bold flavors and bright colours – a winner! The next two vegetable dishes represented both the high and low choices of the evening. To start with the low we tried the wood roasted cauliflower with romesco ($8.50). This dish just didn’t do it for me. I’m not a fan of cauliflower and even sitting in a rich tomato sauce couldn’t sway me on that. On the contrary, the crushed and fried Kipfler potatoes with picked red onions, dill and aioli ($7.50) was firmly at the top end of my favourite dishes that night. Super crunchy and impressively not overly oily, the potatoes should definitely be on the list to try. Another visually striking dish set down before us was the butterflied wood fired king prawns with roast chilli and saffron puree ($16). The prawns were succulent and matched well with the saffron puree. The hot & spice lamb meatballs were served with a crushed tomato, red wine, basil and chilli sauce and served with sourdough ($12.50) As the name suggests, these balls have some heat! A substantial serve and would be paired well with a bold red wine. The slow cooked short rib served on mash ($17) is a delightfully rich little morsel that has the meat falling off the bone! I’d put this as more of an individual serve than a share plate..or a serve between two people. Sweet indulgences are always easier to justify when shared and luckily Sarita’s offers some delightful daily dessert options. We sampled the lemon brulee tart and the individual tiramisu. The tart had a well-balanced citrus flavor and the tiramisu was delicious and I judge restaurant tiramisu harshly against my mothers version. I have to say I was very impressed with the taste and moist texture. 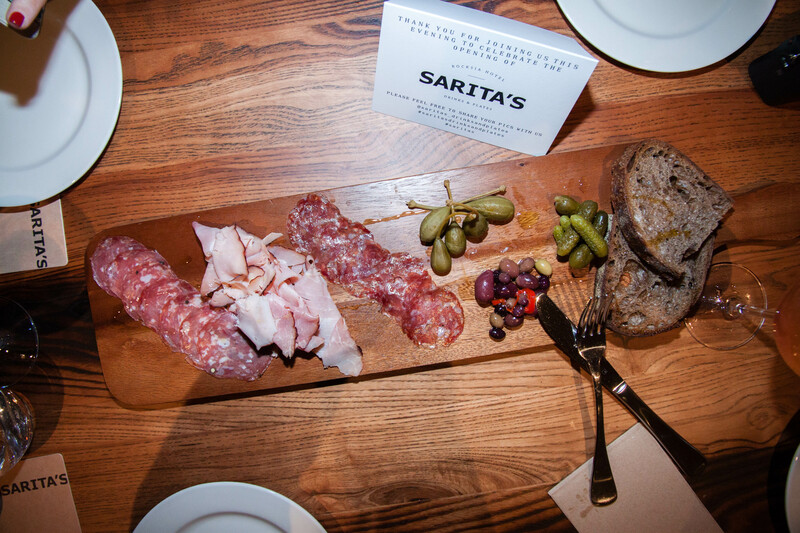 I believe that Sarita’s will establish a reputation as a go-to place for locals looking for a casual bar that serves up food with finesse in a chic yet casual setting. We enjoyed it and hope you do as well! mmm~~ I would totally love the fried Kipfler potatoes any day! It sounds so … unhealthily, healthy at the same time! haha! And you totally had me at lemon brulee tart! The kipfler potatoes were the bomb! Would totally get them again on our next visit! Everything looks so damn good!! But the yellow fin tuna carpaccio and short ribs looks and sounds outstanding! The tuna was definitely a stand out! !